As I mentioned in my previous report from the AAAS Meeting in Washington, DC, this past weekend, one of the hot topics of presentations and discussions was the search for other earths, exoplanets and exo-planearty systems, as well as the search for life (mainly on Mars), and the implications of such potential discoveries in the near future. I will not comment on the session titled “Astronomical Pioneering: The Implications of Finding Other Worlds”, since I was on it, alongside Wesley Traub (NASA/JPL), Howard A. Smith (Harvard Smithsonian Center for Astrophysics), Jennifer Wiseman (AAAS Science and Policy Programs, the organizer of the session), Seth Shostak (SETI Institute), and Owen Gingerich (Harvard University, as a discussant). Abstracts for each of the talks can be found under the webpage here. And Salman has now provided rather detailed reports on it. The two sessions I would like to report on are: “Kepler: Looking for Other Earths”, “The Universe Revealed by High-Resolution, High-Precision Astronomy”, and “Seeking Signs of (ET) Life: The Search Steps Up on Mars and Beyond”. The Kepler session lasted 3 hours and included 6 presentations, each more fascinating than the others. A few weeks ago, the Kepler mission (telescope/satellite) had made a series of press releases reporting on the tentative results from roughly a year and a half of data. The major highlights included the fact that some 1,235 candidate planets are being checked for confirmation (while in 15 years fewer than 500 planets had been discovered), as well as several firsts, such as the smallest, rocky planet detected so far (Kepler 10b, more on this one below), a “solar system” with 6 planets (Kepler 11 – more below), one system where two planets are on the same orbit (following one another with the same speed), etc. Now, while there is no question that the Kepler discoveries represent a quantum leap in exoplanet research, there are a number of caveats that must be stressed and kept in mind when considering all the results; otherwise one may start drawing largely erroneous and misleading conclusions. Most importantly, one must recall that Kepler is still largely biased toward the short-period planets, i.e. ones that are very close to their stars. It can detect planets with orbits like Earth’s or even Jupiter’s, but it is much easier for it to discover planets at distances like Mercury’s or even much closer. With that in mind, Kepler finds that 10 percent of its candidate planets are Earth-sized, which of course is not the same as Earth-like. Also, about one sixth of the host stars have several planets, 3 % of those stars have 3-4 planets, but 66 percent of the candidate planets are lone ones. I would also like to mention some idiosyncrasies among the (candidate) planets found by Kepler. The smallest one (Kepler 10b), with a radius 1.4 that of Earth (a result determined to within 2 %! 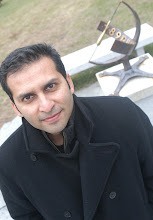 ), is extremely close to its star, ten times closer than Mercury, and it is locked in its rotation-revolution, making the side that always faces the star so hot (T higher than 2,000 K) that its rocks are melting like lava, while the other side (the night side) is much cooler and might even have some dust/evaporated particles floating above it there. The most important thing about this planet is that it is the first confirmed rocky exoplanet! How do we know that (for sure)? Because its mass has been determined to be 4.6 that of Earth’s (plus or minus 1.3), giving an average density of 8.8 g/cm3 (plus or minus 2), which is definitely rocky. Do check out the superb animation that has been made about this planet (depending on the speed of your connection, you may choose to run a low-res, med-res, or high-res version of the movie).One should note that previous candidates had been presented as rocky planets (Corot 7b), but large uncertainties in their parameters made the claims much less sure-footed. 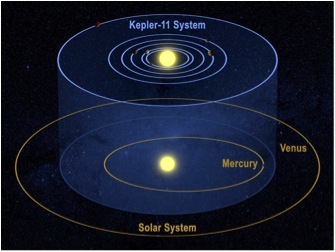 Another fascinating result was the Kepler-11 system of 6 planets, five of which closer to the star than Mercury is to the Sun and a sixth one on an orbit of size between those of Mercury and Venus (see diagram below). More interestingly, they’re co-planar, orbiting in the same plane, like our own solar system, where all 8 planets orbit within a few degrees of the ecliptic plane. Those 6 planets are all of medium size (between 2 and 5 Earth radii), but surprisingly not rocky! The most important idea I came away with from that session, in particular, is that astronomers have now made quantum leaps not just in the number of candidates they have come up with but also in the quality of the data and information that can be inferred about those planets. Indeed, there have been some revolutions in the techniques that can now be used in the detection and data analysis. In particular, I want to mention the Transit Timing Variation Analysis, which considers not just the data from the transit that a planet makes in front of (and now, very interestingly, behind) its star, but the variation of the timings of those transits, which is like a first- or second-order perturbation that can tell us quite a bit about various physical parameters of the planet and its orbit. The transits of a planet behind its star can also be used to glean information about the planet’s physical features, mainly from the amount of light that gets reflected from its surface as it comes in or out behind the star. I want to also mention the technique of radio detection of planets that has been proposed. When I heard the title, I kept asking myself how that was supposed to work, and once it was explained, I marveled at the ambition and optimism of researchers (in this case and in general). In this technique, a “VLBA” radio interferometry system (several connected radio dishes at a large distance from one another) covering a continent (!) is used to detected the variations in the radio emissions from a star, which – if it has a planet – would be pulled back and forth and thus have the wavelength of its emission vary toward “the blue” and “the red” (the usual Doppler shift). But does a star emit much in the radio band? Some do, if they’re active and flary, and indeed the researchers are proposing to look at about 30 nearby stars (up to 10 pc, i.e. about 33 light-years)… I say: good luck! And last but not least, there were a couple of nice presentations in the session on the search for extraterrestrial life, mostly focused on Mars, particularly Andrew Steele’s The Search for Life on Mars: Mars Science Laboratory and Mars Sample Return and Michael Meyer’s “Grand Challenges in Astrobiology” (a replacement talk, thus no abstract on the web). I was surprised to hear from Meyer that the famous Martian rock ALH84001, which made the news back in 1996 with claims of microscopic fossil life (from Mars), still has strong proponents defending the claim. Meyer explained that the problem in the search for extraterrestrial life is how to recognize ET bio-signatures. Indeed, there are always ambiguous features that are difficult to conclude from. But why Mars? Because it has a well-preserved geological and climate record right on its surface, unlike Earth, which has been so shaken and eroded that there are only two dozen places where one can find ancient (billion-year old) rocks to analyze. The important development in the field is the imminent (November 2011) launch of the Mars Science Laboratory (MSL), a sophisticated and large robot that will explore, retrieve, and analyze samples in mostly autonomous “artificial-intelligence” manner. 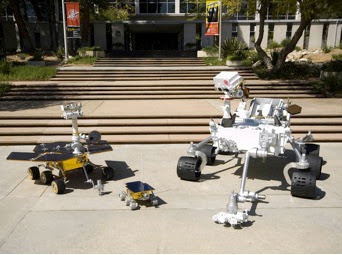 See below a comparison of the sizes of MSL (the white one) with Spirit (on the left), which was active on Mars from 2004 to 2010 and Pathfinder’s Sojourner (the small rover in the middle), which worked for a while in 1997. Thank you so much for this fascinating wealth of information. I thoroughly enjoyed reading every word of it. The thought of the exciting times that seem to be ahead is itself exciting. Few things came to my mind on reading the paragraphs on Kepler 10b and also Kepler 11 system. How can planets even form so close to its star? Do we need to revise the present theory of planet formation? If the side facing the sun of Kepler 10b is melting, does the mass or size of the planet reduce with time? I am surprised that it even exists after millions of years. (I am assuming here that it is at least millions of years old). Also, if one side of Kepler 10b has a temperature of 2000 K the cooler side will also have a temperaure of 100s of Ks? You forgot to give the link for the animation abuot this planet that you mentioned. Thanks once again for this intersting post. Waiting eagerly to hear about your presentation. Salman promised that he will tell us about it. May be that explains the high density of the planet? I was proabaly right in thinking that the "cooler" side will also have a temperature of hundreds of degrees. How will we ever be able to span the interstellar distances? travelling THROUGH the distance is impossible. Any brilliant alternative idea? Any plausible fantasy? Ali, thanks very much for your enthusiastic feedback. I am really glad you liked the report and the info on those exoplanets. 1. At the temperature (T) of the day-side of the Kepler 10b planet, I think the rocks are not being evaporated much; I don't know what T is needed for the direct evaporation/sublimation of rocks (probably depends on the pressure), but my guess is that there is mostly melting. So the mass loss is minimal or the mass loss rate is very slow. And we have no idea when that planet formed.